Log is pasted after this - have used P2P from Emule thru Limewire then Frostwire. Latterly had noticed and read about growing number of issues and have not used at all in last 6 months but never got round to deleting it. Small point though, have had to delete manually as it didn't appear in Control Panel - is that odd or not? Anyhow as promised and hope it all amkes sense to you! Object: C:\Documents and Settings\HP_Owner\Cookies\ ???L? ?? You can never have too much of what you don't need. have had to delete manually as it didn't appear in Control Panel - is that odd or not? Some of them have their own uninstaller. Just look at All Programs and see if there an uninstaller for that program. Or, you can see if HJT will find it. 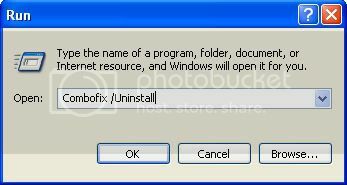 •Click on the Open Uninstall Manager button. •Highlight the entry you want to remove. Wow, that took a long time (almost 6 hours!) - slept thru most of it. Have just re-started and (so far) no d**mned messages! Also, why did you appear a little critical of Firefox v Explorer - are there serious security problems with it? Firefox is reported to be a safer browser than IE but I'm not critical about Firefox. In fact, I use both. Let's give it a few days to see what happens and then come back and we'll do some cleanup. Thanks for that. Just a small note to say I did first cold start this a.m. and again no repetition of the problem. If I may ask a slightly unrelated question - McAfee Security Centre is pretty resource hungry and vibes I'm getting from around the Net are that it's not as efficient as some of the free systems like AVG. What's your take? McAfee Security Centre is pretty resource hungry and vibes I'm getting from around the Net are that it's not as efficient as some of the free systems like AVG. What's your take? In my opinion, the best of the free AV's is MSE. It's lightweight and updates all the time and no need to register; install it and forget about it. AVG is also very resource hungry. We may just as well do some cleanup. If this doesn't remove ComboFix, please let me know. Use the Secunia Software Inspector to check for out of date software. •Check the box next to Enable thorough system inspection. •Allow the scan to finish and scroll down to see if any updates are needed. Oh dear - switched on this a.m. and the messages are back. I thought they might be as I was updating my GTA user radio file and as I was copying across the message flashed up again. That might mean that there's a nasty in my music files or there's a meanie in the games disk (unlikely I guess). Before I follow your last lot of instructions, how should I proceed next? Also should mention there was an update of McAfee during the day - again it seems unlikely but is it possible there's a glitch in my files that might be causing this? again it seems unlikely but is it possible there's a glitch in my files that might be causing this? I'm sorry but I'm at a loss as to what to do next. Are you just getting the WFP message? Have you ever received messages like this? Files that are required for Windows to run properly have been replaced by unrecognized versions. To maintain system stability, Windows must restore the original versions of these files. Insert your product CD-ROM now. Files that are required for Windows to run properly have been replaced by unrecognized versions. To maintain system stability, Windows must restore the original versions of these files. The network location from which these files should be copied, \\server\share, is not available. Contact your system administrator or insert product CD-ROM now. Note: You must be logged in as Administrator to receive these messages. Yes, the first of the 2 messages you quote has been the one appearing regularly for the past couple of weeks. You may recall that I bought the machine 3 years ago without a system disk (Its a hewlett packard by the way) but with Windows XP duly loaded up and full I386 backup. Until this started I'd never had this message before. It seems odd to me that there is no software that seems able to monitorregistry files and identify which ones are specifically unregistered so that I/we can pinpoint the area that's causing problems. Maybe it's just something I'll have to live with. Should I continue with the instructions from your previous post or go back over some of the prior routines - if the latter, advice please. If there's nothing else you can suggest then many thanks for your efforts and my apologies for being a nuisance! I'm going to check with my colleague about this problem. Ok. Let's try this. Please remove McAfee using this tool below and then re-install McAfee and see what happens. Download the McAfee Consumer Product Removal Tool to your Desktop. * A Command Line window will be displayed, and then close automatically. * Wait for a second Command Line window to be displayed. Note: Do not double-click MCPR.exe again, you may have to wait up to 1 minute for the next window to appear. * After the second window appears, the program will begin the cleanup. * Press Y on the keyboard. * Wait for the computer to restart. * All McAfee products are now removed from your computer. Okay, that's done. 2 warm starts and no re-occurence so I'll wait for the next cold start before I get too excited! Apparently McAfee doesn't get along with Malwarebytes or Spybot. I've let it delete the first but it couldn't scupper the second. Cold start resulted in 2 things - first a re-occurrence of the File Protection message - just once though, not twice) and then a re-installation of McAfee which I can only assume was automatically generated from the host after I deleted and didn't noticed that I'd manually re-instated it! Just warm-started again and again got a single repetition of the problem - maybe we're making some progress. I want to remind you that this is not having any apparent negative effects on speed or performance. Did you use the Removal tool I provided? Programs do not re-install by themselves unless it's malware. Please run this scan for me. * Double click on the icon to run it. Make sure all other windows are closed and to let it run uninterrupted. * When the window appears, underneath Output at the top change it to Minimal Output. * Check the boxes beside LOP Check and Purity Check. * Click the Run Scan button. Do not change any settings unless otherwise told to do so. The scan won't take long. Please copy and pate the contents of these files, one at a time, into your next reply. Note: You may need two or more posts to fit them all in.